Procrastination Station: Bring on the Chicken Scratch! Bring on the Chicken Scratch! My Chicken Scratch products from the March Papertrey Ink Release made their way to me. It's been a flurry of activity ever since. So much fun to create with this group of products. I'm working on a big post with lots of cards on it, but I thought I'd pop in here with the first card I created. Because I just couldn't wait! I had already been working on this card when my package arrived. I had the bouquet wrap made from the Scissor Keeper Dies from the Quick Stitch Sewing Staples Kit and I had the flowers cut, stamped and ready to go (the kit exclusive stamp set). I was just uninspired as to how to place them on my card. Then the mail came. And low and behold, the perfect solution! I took a piece of the Fine Linen gingham paper from the Chicken Scratch Paper Pad and trimmed it down. Then I just took the "x" stamp from Chicken Scratch and stamped it in Blueberry Sky ink on the dark squares along the border. Perfect. And so very easy. Very simple way to "scratch". :) The scale of the gingham in the paper pad matches the size of the stitches for those times you want a completely no-brainer chicken scratch application. I have been wanting to try the original form of chicken scratch embroidery for some time now. Crazy to think about that I got inspired for the all the Chicken Scratch stamping products without having seen this particular embroidery style in real life. Only way to solve that is to make some myself. And thus, we now have two Chicken Scratch Scissor Keepers being put to use at my house. 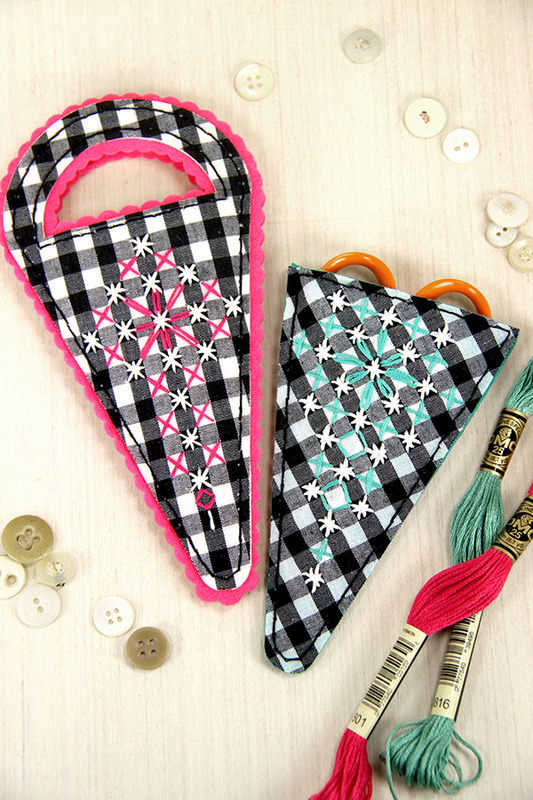 I first made one the basic way, with the scalloped liner layers from the Scissor Keeper Dies (Quick Stitch: Sewing Staples Kit). I used Heat N' Bond to adhere and stabilize my black gingham fabric to my felt. You can see a video tutorial here on how to do that. Then I just sort of made up my design. I have a close up of it here so you can do it to if you so wish. I bought the fabric at Joann's and the squares seem to be sized to 1/4". My second attempt was a subtly different. Obviously I cut off the handles and didn't use the scalloped liner portion of the Scissor Keeper. I also cut the gingham at an angle. See how it is oriented on the diagonal here? It doesn't make much difference in the stitched design towards the top, but lower down, where the scissor keeper narrows, it looks less blocky to me, which I like better I think. What is your preference? More Chicken Scratch to come over the next few days! Thanks for stopping by. 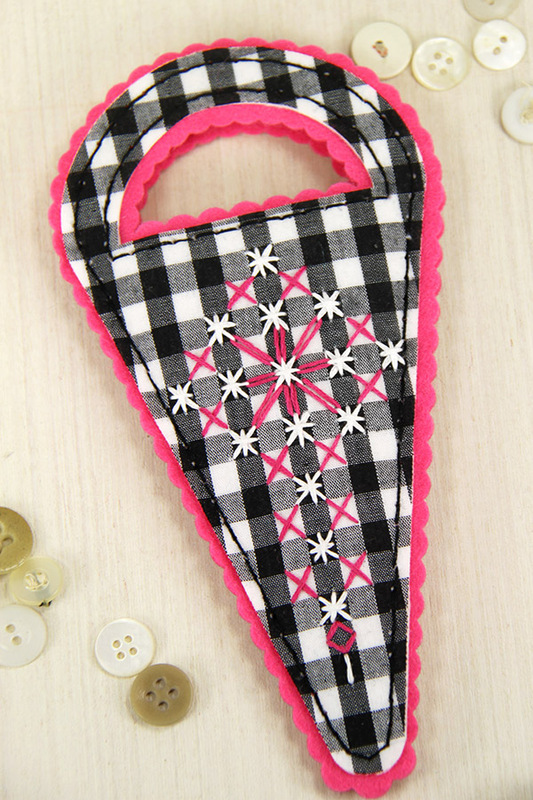 I love the gingham on the diagonal! Beautiful work, Erin! I am enjoying the first Stitching kit. Keep those awesome kits coming! I am in need of help. Tried to cut out the scissors Keeper die with the cuttlebug. It did not cut. I used the following sandwich which will not go through the machine: platform, metal shim, rubber pad, b plate, felt, die, b plate. If I take out the metal shim or rubber mat it won't cut. I tried using several sheets of paper. Not luck. I would be so appreciative if anyone has a suggestion or advice, or instruction. Thxs! Two suggestions for you. Try cutting up into the felt instead of down. And then maybe at an angle. If this doesn't work, it is possible that you got a defective die. Contact Customer Service for a replacement:). Thxs so much. I'll try both suggestions. I was contemplating buying a vagabond or big shot. Sounds like that isn't necessary. I love the kit and concept, can't wait to get started. 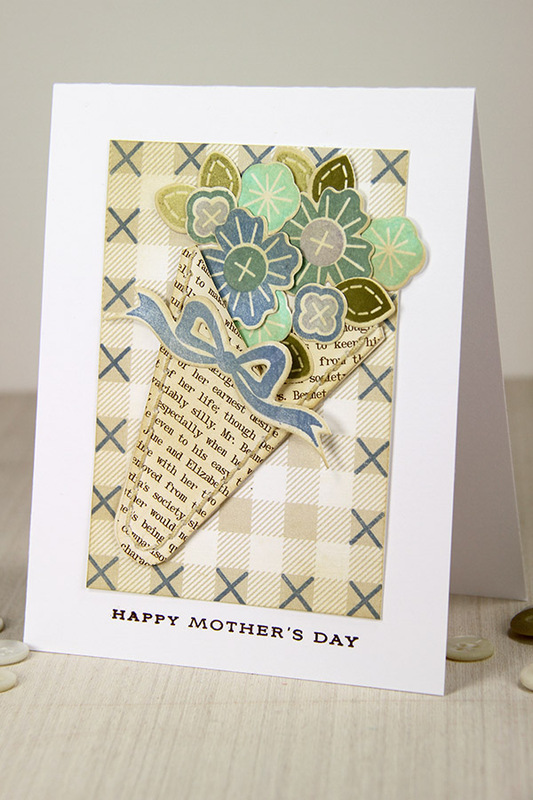 How did you use the die for the mothers day card? 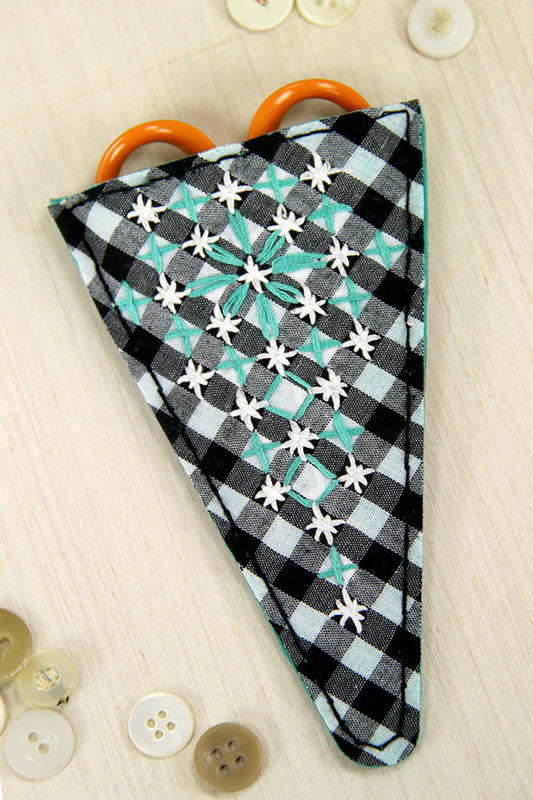 I like the idea of using that scissors keeper die that way! Did you alter it or cut anything off? I cut three scissor keepers out of the Dearest Jane paper. They weren't full cuts. Maybe 2/3 of the blade part. I trimmed them down to make my flower wrap. The two front ones got cut at angles and overlap when placed on top of each other. And the third one was the back. Then I just sewed them up.